*Button on left : gconftool-2 --set /apps/metacity/general/button_layout --type string "close,maximize,minimize:menu"
*Button on right : gconftool-2 --set /apps/metacity/general/button_layout --type string "menu:minimize,maximize,close"
This idea is to simplify the repositioning, anyone who wants it, metacity buttons in easy and fast way for all. I wont add than option is just avaiable. I just migrate the button on left and on right with pressing alt+F11 and alt+F12. In /apps/metacity/keybinding_command modify: "command_1" and insert : gconftool-2 --set /apps/metacity/general/button_layout --type string "menu:minimize,maximize,close"
In /apps/metacity/keybinding_command modify: "command_2" and insert : gconftool-2 --set /apps/metacity/general/button_layout --type string "close,maximize,minimize:menu"
Is not visible in metacity menu but work perfectly. The bug is only to implement this strings and this voices in metacity menu. If I understand correctly, this has been suggested in bug #532633. I understand that you may not have seen it due to the amount of comments in that bug report. If this is what you are suggesting, this bug should be filed against "gnome-control-center" & this bzr branch should be linked to this bug report as it will most like become lost in bug #532633. I dont mean to modify the control-center. If fix metacity menu for look the added commands in /apps/metacity/global_keybindings this bug is solved and fix the bug of metacity menu and enough to implement 2 string and 2 keybinding option for choise the side of metacity button and solved this bug. Open new related bug for solved this. As I misinterpreted what you were asking, I will make this a dupe of the new bug you have opened so that this info isn't lost. Please disregard comment #2 - sorry for the confusion & bugmail noise. The bug Bug #543125 is because metacity dont show added keybindings and this is for show by default the keybindings for switch the metacity button on the left and on the right in metacity menu. Can you explain what you mean by "Metacity menu"? Do you mean the menu you get when you right-click on a title bar? This is a new option that has been added. 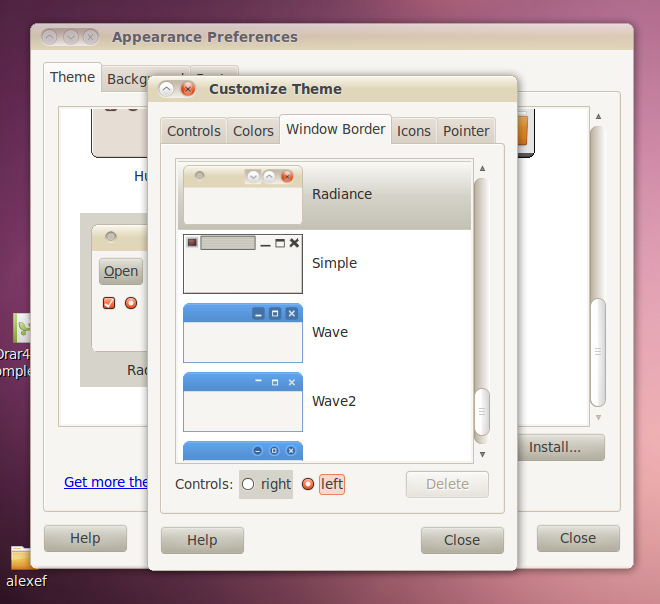 and also, when they select the new theme , they can choose to /not/ use the button layout if they want. A prompt asks for confirmation before switching layout.